This secure 10ft Trampoline Tie Down Kit is suitable for use with our 10 foot trampoline. It is strongly advised that you use a tie down kit to properly secure your trampoline during play. 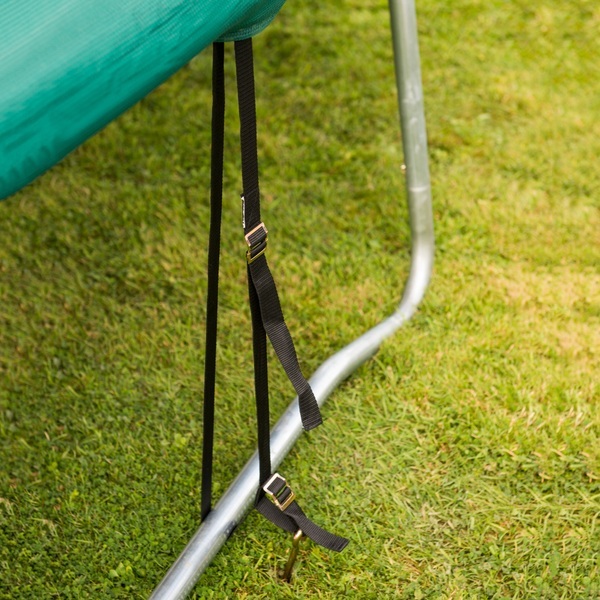 Tie down kits are designed to keep your trampoline secure and safe while it is in use. The 10ft Trampoline Tie Down Kit anchors your 10 foot trampoline to the ground for increased stability during play. The tie down kit is adjustable at two different points, so that you can adapt it to provide the most secure fit possible for your trampoline. The strap of the kit hooks easily and securely onto the included ground pegs to provide a strong and secure anchorage that allows the trampoline user to bounce and play on a safe and stable surface. It is important to note that a trampoline tie down kit is not sufficient to keep your 10 foot trampoline secure in windy or stormy weather conditions. In such adverse weather, it is recommended that you disassemble your trampoline and store it safely away until conitions have improved. This 10ft Trampoline Tie Down Kit is suitable for use with our 10ft Trampoline and Enclosure (Ref: 162030/162793) sold separately.